Human OMgp, His Tag (OMG-H5228) is expressed from human 293 cells (HEK293). It contains AA Ile 25 - Asn 420 (Accession # AAH18050). The protein has a calculated MW of 45.5 kDa. The protein migrates as 90-120 kDa under reducing (R) condition (SDS-PAGE) due to glycosylation. >92% as determined by SDS-PAGE. Human OMgp, His Tag on SDS-PAGE under reducing (R) condition. The gel was stained overnight with Coomassie Blue. The purity of the protein is greater than 92%. 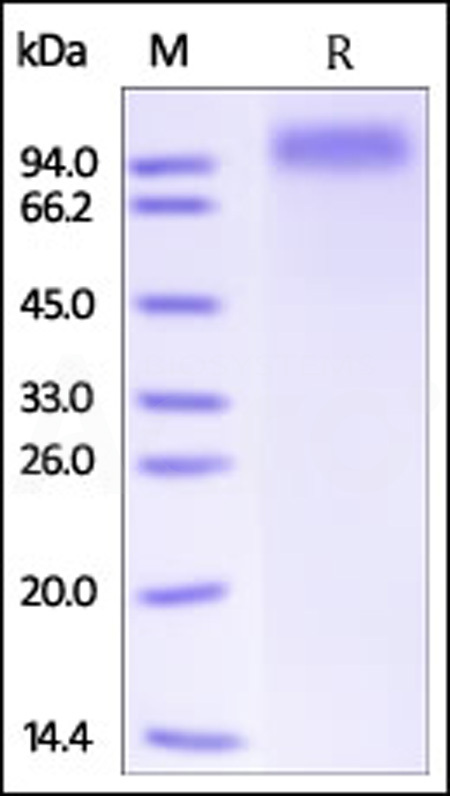 Oligodendrocyte-myelin glycoprotein (OMG or OMGP), is a cell membrane protein which contains eight LRR (leucine-rich) repeats and one LRRNT domain. OMG / OMGP is a glycosylphosphatidylinositol-anchored protein expressed by neurons and oligodendrocytes in the central nervous system (CNS). OMG / OMGP play roles in both the developing and adult central nervous system. OMG / OMGP may also be involved in the formation and maintenance of myelin sheaths. (1) Mikol D.D., et al., 1990, J. Cell Biol. 110:471-479. (2) Mikol D.D., et al., 1988, J. Cell Biol. 106:1273-1279.